Roll is standing quietly as he usually does while I was speaking to a tour group with the gate wide open, but this was not always the case with him. 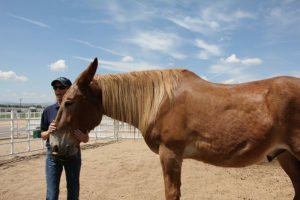 He used to hide behind Rock and snort at me when he first arrived with Rock in December of 2010. 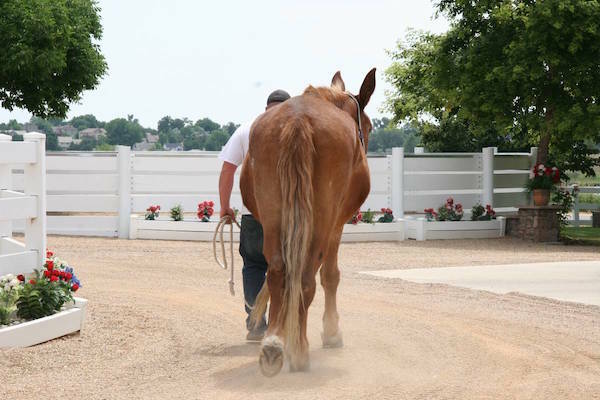 Behavior Modification is a reward system of training that requires that the trainer has the ability to distinguish between good and bad behaviors, to reward them promptly and appropriately…and, to do it politely with respect for the animal. 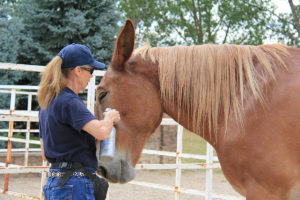 The oats are a reward that is both safe and enjoyable for equines, and is something that they will continue to work for. 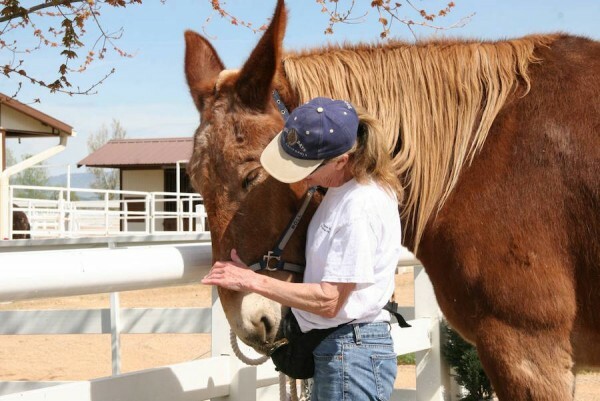 When dealing with an equine that is easily ten times your own weight, it is hard to imagine that the way we talk, touch and interact with our equine would really need to be ultra considerate, light and reassuring. However, if you want their complete cooperation, that is exactly what needs to happen. 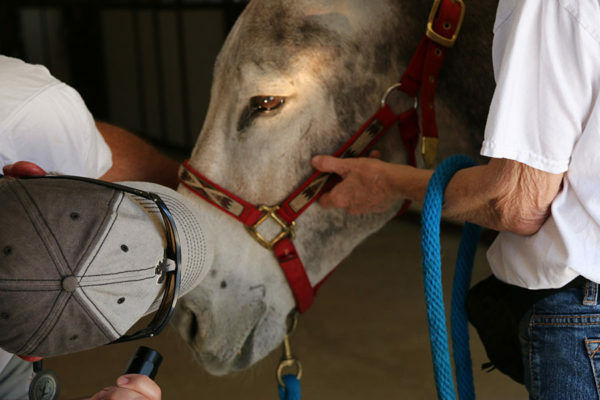 For instance, when applying fly spray talk gently and calmly, and be careful not to get the spray in their eyes…or it will burn and they will be less likely to comply the next time! The same consideration hold true when bathing. 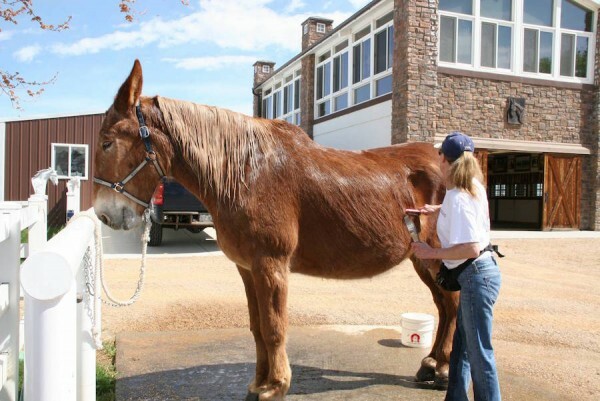 Be careful not to get water in the ears, eyes and nostrils…and accustom the equine to cold water by spraying the feet and front legs first and work your way up to the face. 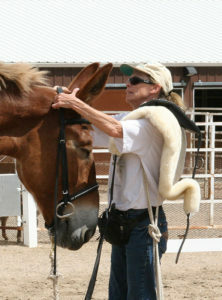 When you are kind and considerate, and give the equine time to adjust, even mechanical equipment like a massage thumper for muscle relaxation, or an equine vacuum cleaner used not only to clean but also to promote better circulation, can become a real source of pleasure and enjoyment for your equine. When the equine is relaxed and accepting of the equine chiropractor, veterinarian and farrier, they are better able to do their jobs with maximum efficiency and successful outcomes. 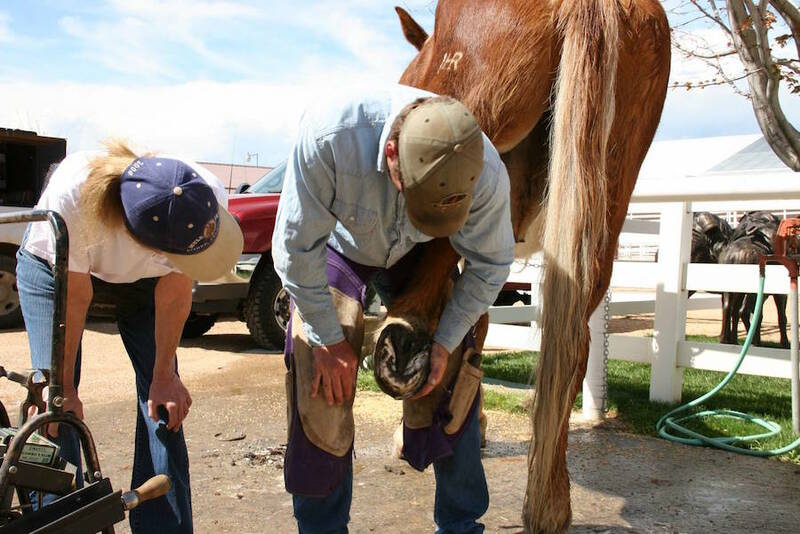 And jobs you have to do like clipping, bridling and taking off the bridle all get much easier, preserving the trust between you. 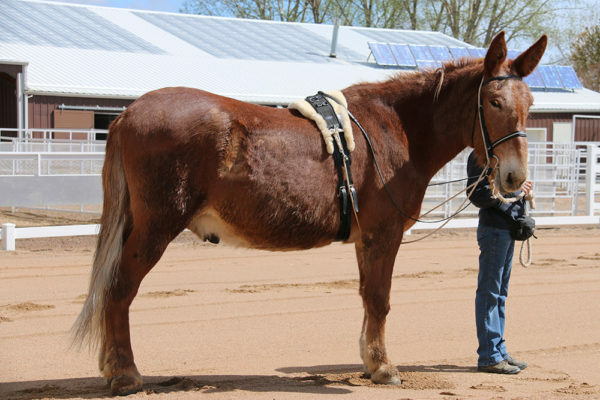 Now at 26 years old, Roll is a NEW draft mule! 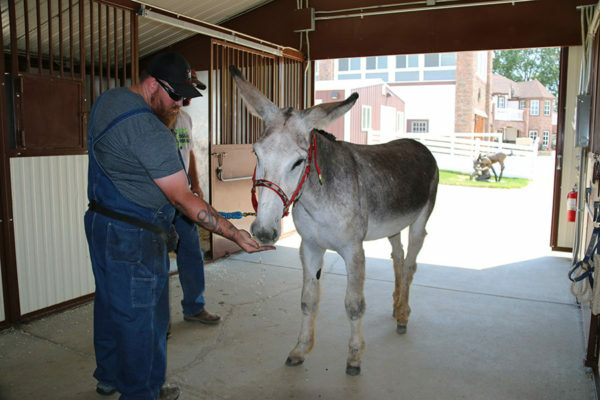 Our miniature donkeys, Spuds & Augie, have a day in the “spa”. 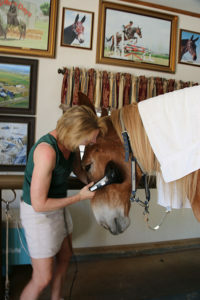 Watch the adorable music video compilation of their grooming sessions. 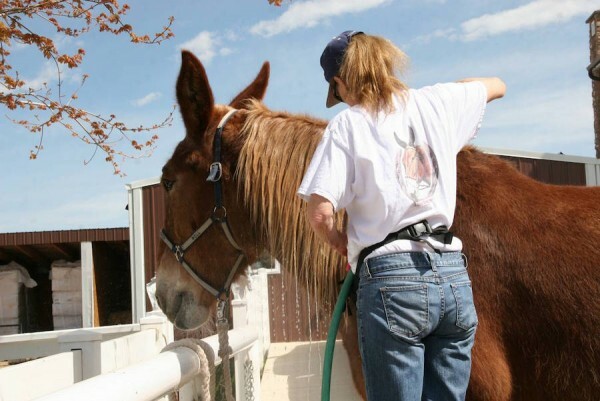 It was a beautiful spring day today, so I took advantage of the warm weather and washed the dirt and baby oil out of Roll’s mane and tail before our farrier, Dean Geesen began to work on him. 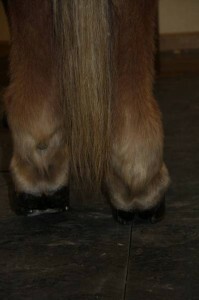 Then I went over his body with a regular hairbrush that pulls most of the loose underneath hair out. 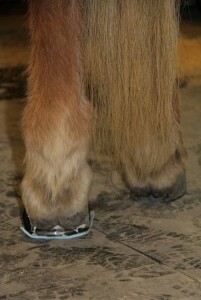 The hairbrush works better than any other shedding tool because it does not cut or damage the hair. 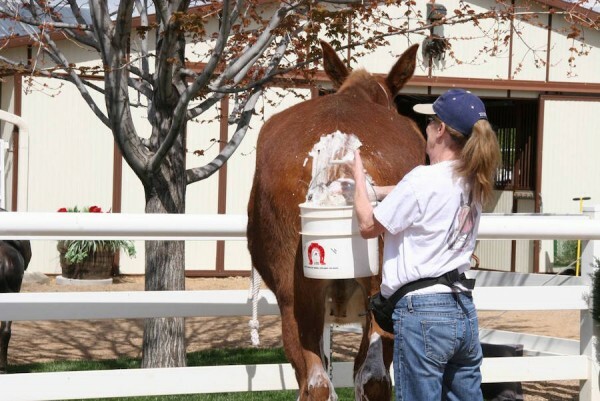 We only use the shedding blades when the equines have mud on them and to scrape off excess water. 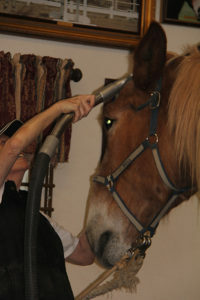 He seemed to enjoy getting his mane and tail cleaned and his coat “aerated!” He sure looked amazing when I was done! Then Dean took off the boot on his left hind so we could see how the White Line Disease was doing. He has grown substantially more hoof and is staying balanced on it with our efforts on his behalf. 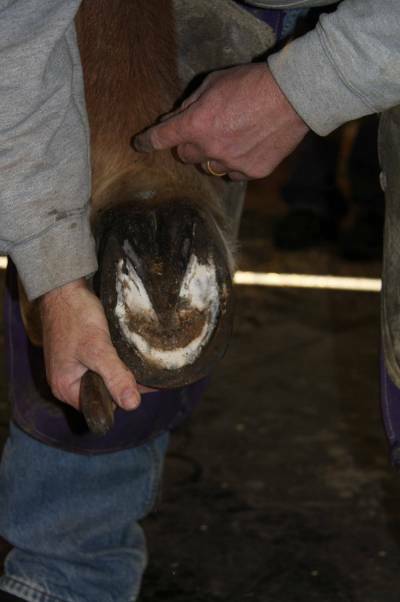 Dean noticed that Roll is now putting pressure on his heel and a bit of pressure on the medial side of the hoof and on the toe. 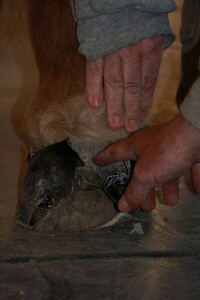 The boot, although taken off twice a day and dried out, appeared to be holding in more moisture than it was before, so Dean suggested that we let him go without the boot and see how he does. We thought he might stay drier now that the weather has been sunnier and drier overall. We are still getting intermittent rainstorms, but Roll prefers to stand inside his stall in the sawdust, so it may be that he can go without his boot…at least for a while. 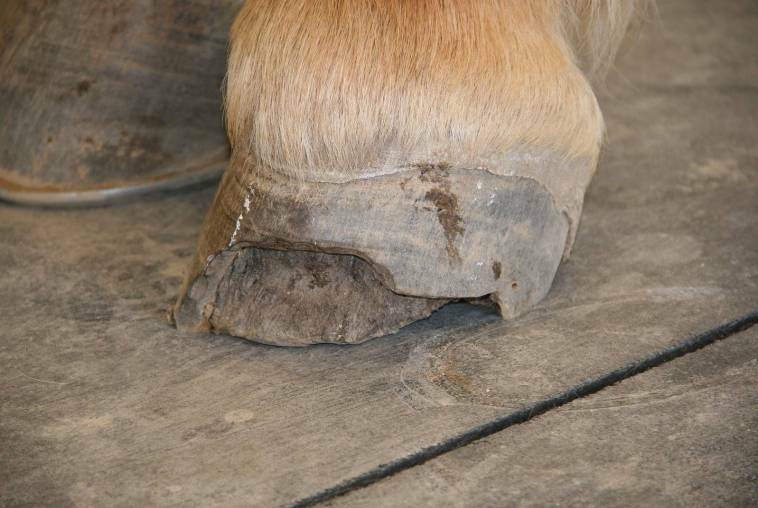 We did see a drop of blood on his sole and his sole was responsive to the hoof tester, so that confirmed for us that there is still circulation in the hoof…a really good thing! We were wondering about that. 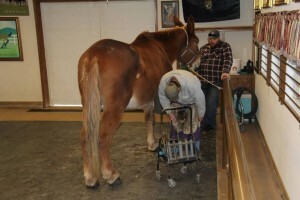 We did have to put the boot on his left hind while Dean worked on his right hind because now that he was “feeling” the sole, it was too much for him to bear all his weight on that hoof alone. 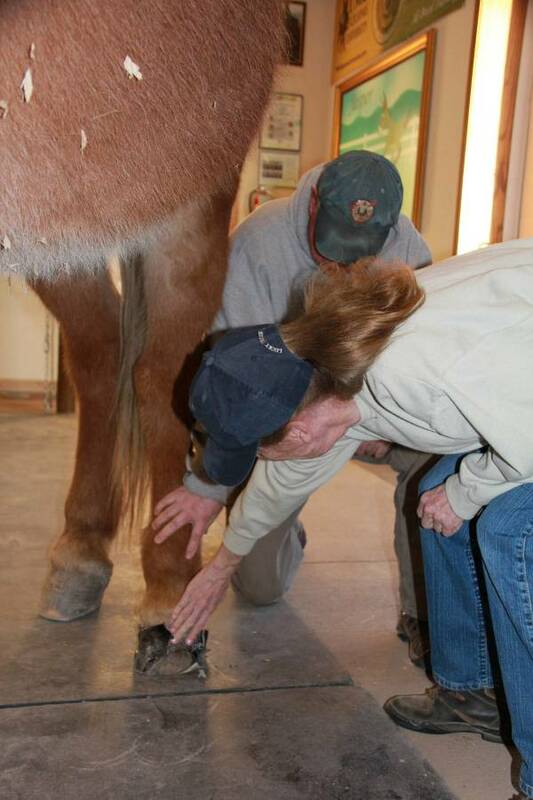 We took off the boot afterwards, before we put him away. Dean had reset the right hind foot with the borium shoe to keep him from slipping and putting undue weight on his bad foot. 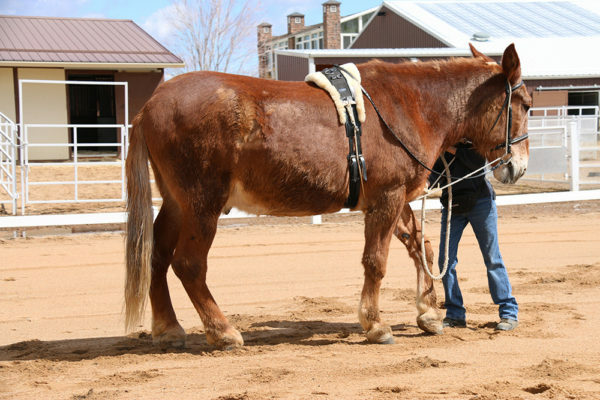 That also seems to be working very well to keep his weight evenly distributed over all four feet. 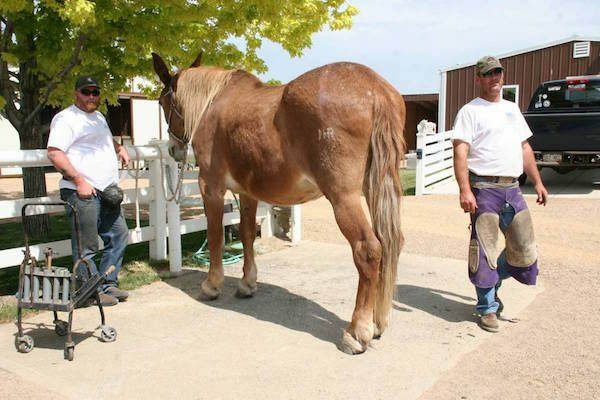 Brandy and Jubilee were curious about what was going on with Roll and the farrier as they passed by on the way to their lessons. All in all, staying flexible and attentive to his needs and all your prayers are helping Roll to get through all this quite nicely. I can only hope this good fortune continues for Roll’s sake!! 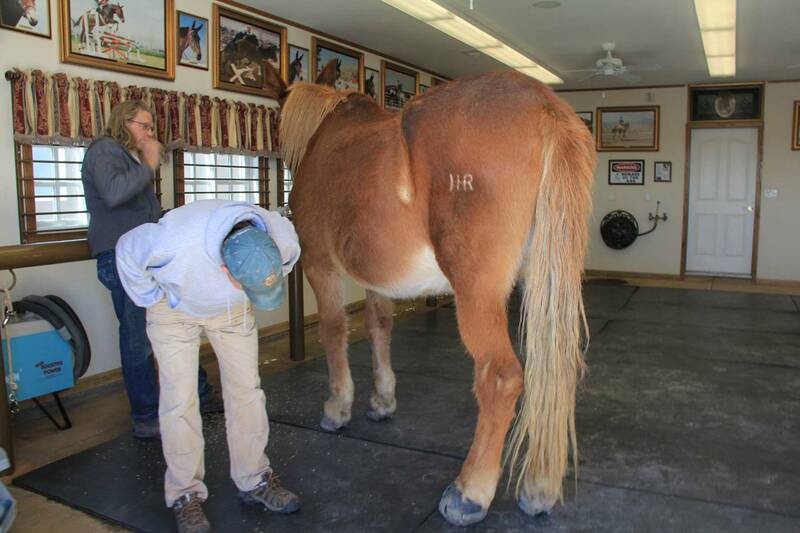 Roll has been coming along quite well with his White Line Disease. 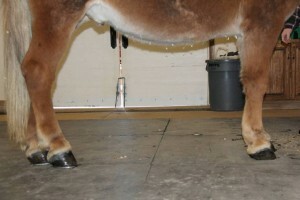 He has been growing a new foot at a rate of about 1/8” per week and is gaining ground. My Ranch Manager Chad had found some thrush around the frog during the morning check. 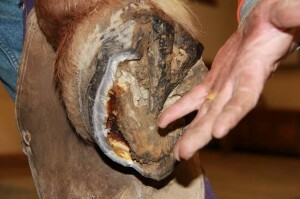 He cleaned it and applied iodine to the area. 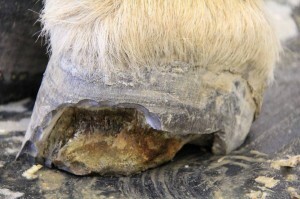 However, we noticed that the lamina growing beneath the old hoof wall at the toe was beginning to curl upward. 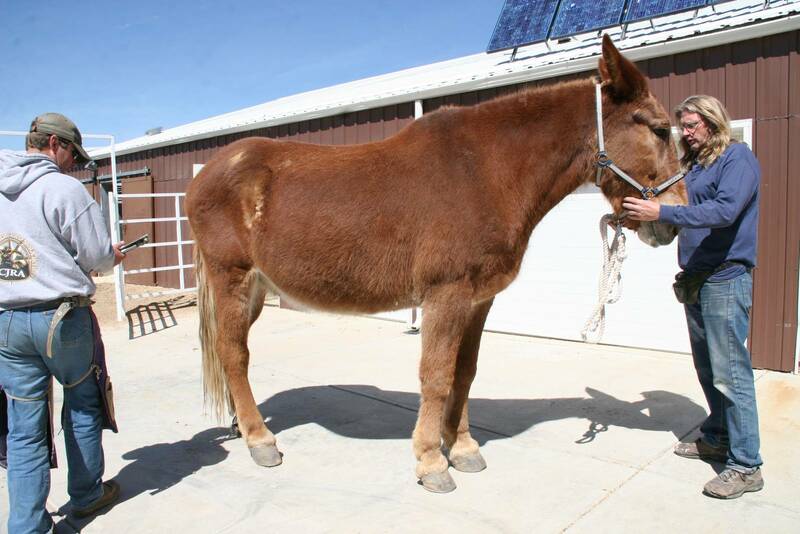 So, we contacted our veterinarian Greg Farrand to come out and take a look. 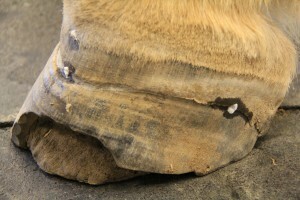 We had concerns that it would push on the old hoof wall which could put torque on the new hoof wall above and possibly cause it to begin to curl up as well. 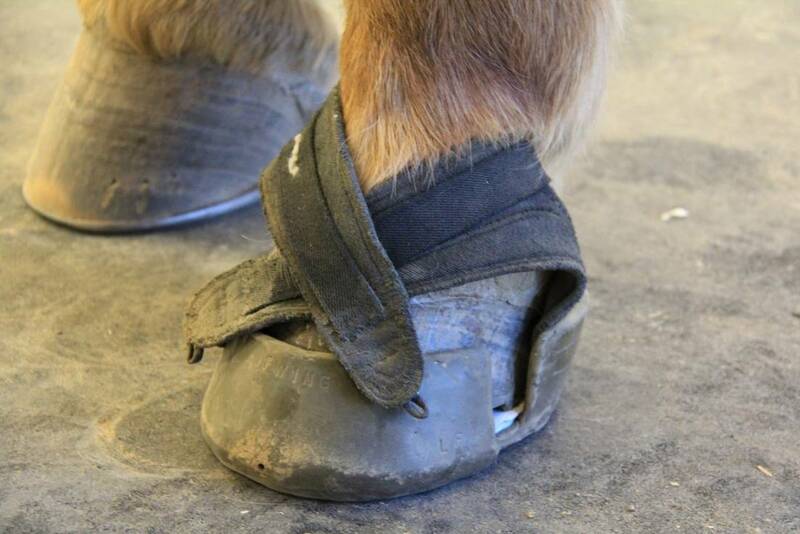 This would result in irregular hoof growth that could result in uneven pressure and an unbalanced foot. 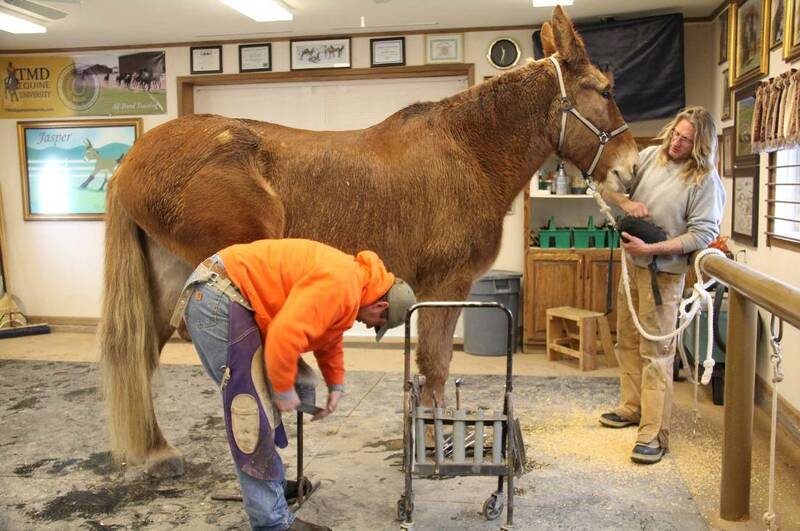 If this occurred, it would result in an imbalance throughout his entire body that could put 3000 lbs. of pressure on the damaged foot and impede our progress with him. 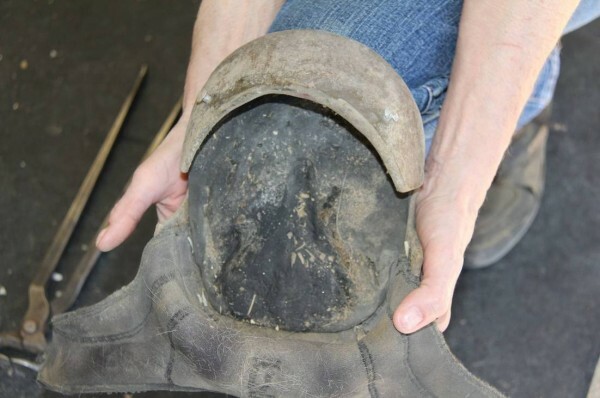 We went from changing the neoprene in his boot every other day to checking it twice a day to brush out any debris and to dry it off so it wouldn’t be SOAKING wet all the time. We took off Roll’s boot and Greg began by testing the hardness of the new growth. We were concerned that it was getting a little soft with our wet spring weather after the snow had melted. It was sunny, warm and dry today, so when he tested the hardness with his little hammer, it was not as soft as we had thought a few days before. 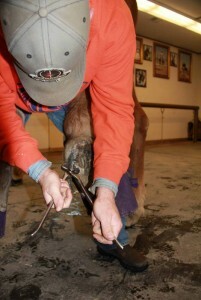 Greg cut off the old dead lamina that was curling up and then trimmed back to healthy tissue. 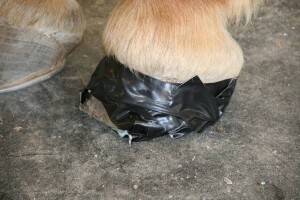 He did this to keep it from separating and tearing off which could possibly causing further problems. After Greg pared off the dead curling lamina, he checked the sole growth for infection and there was none. 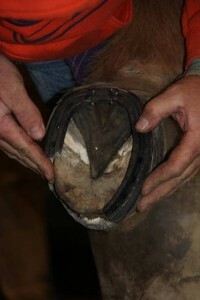 Then he finished paring the dead lamina around the affected sole. 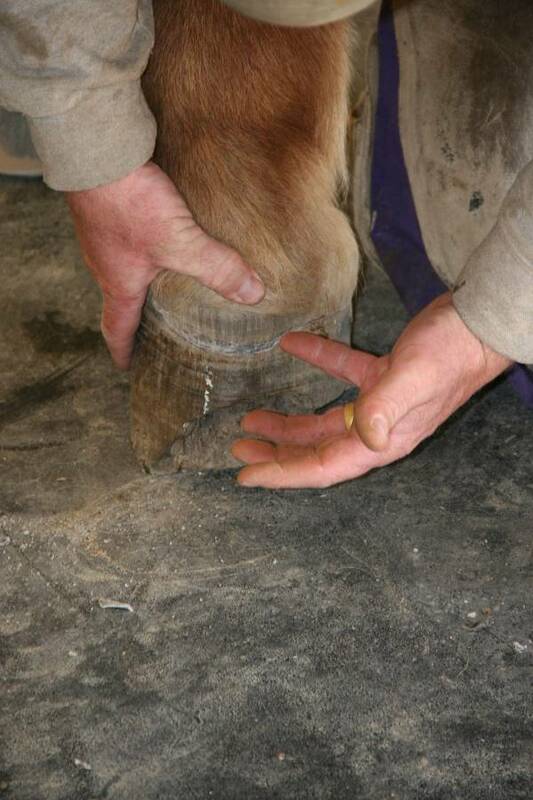 Greg checked for a cavity between the new hoof growth and the old hoof growth to make sure everything was sound. 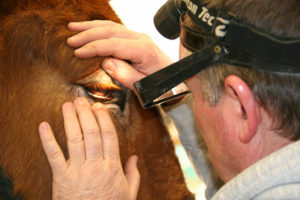 After paring what he did, we were left with healthy tissue and no further measures needed to be taken. 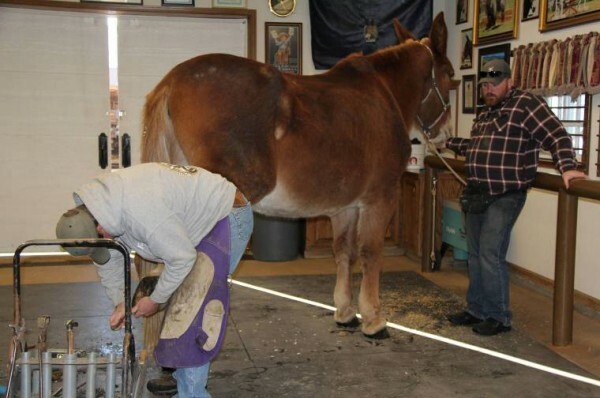 He recommended that the farrier trim his heels down since he had not been trimmed since February 26th. 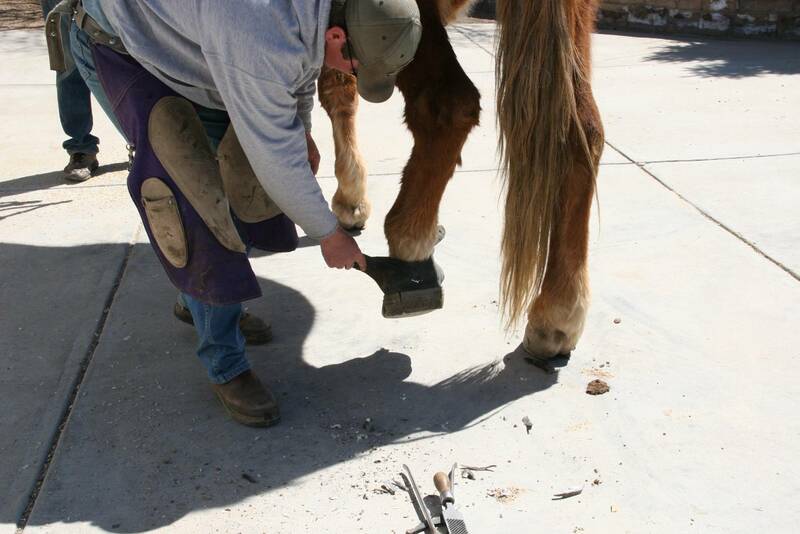 We are now scheduling our farrier, Dean Geesen, to come out to trim him again as soon as possible. We will continue the same protocol and be ready and flexible to promptly handle anything else that might come up in a timely fashion for the best results. Things are still looking positive. We wanted Roll to go as long as possible in between trims because we didn’t want to put too many nail holes in his damaged right hind foot. 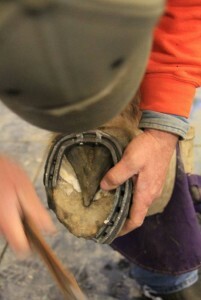 Today Dean Geesen came out and trimmed the foot after our veterinarian had the opportunity to check the foot yesterday. Things are looking very encouraging for Roll as long as we don’t hit any serious snags. 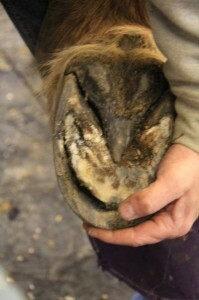 The foot is growing at a rate of 1/8” per week and is producing healthy tissue and no more separation that we can tell. 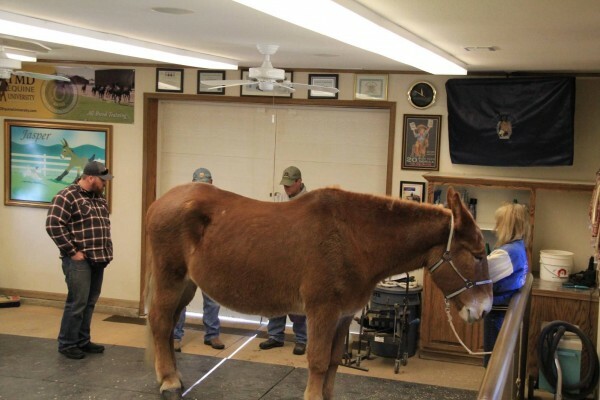 We opted to get him trimmed and then just wait another month and x-ray the foot again to make sure there are no hidden issues. 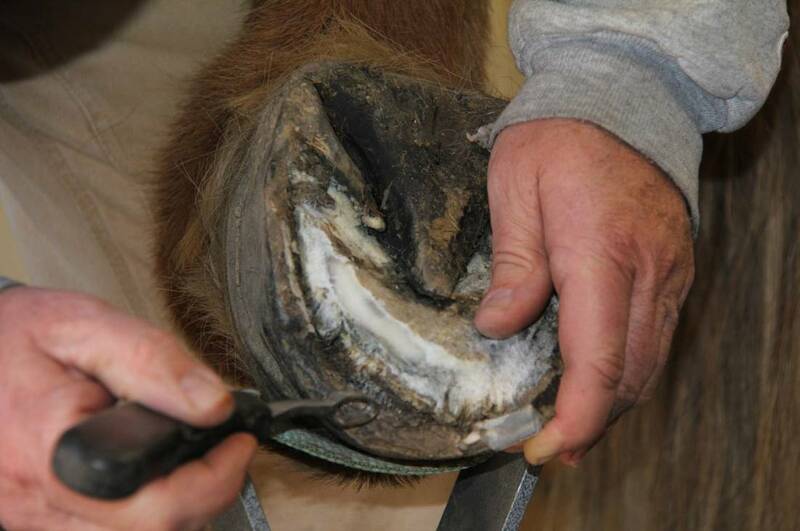 We were changing the boot every other day when the weather was drier, but now we are taking off the boot and cleaning the hoof twice a day, then blowing it dry with a hair dryer to help keep out the spring moisture that was beginning to produce thrush. 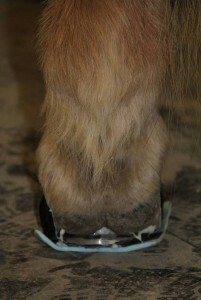 The trimming gave us the opportunity to trim down the heels a bit to get him backed off his toe and to re-balance the foot. 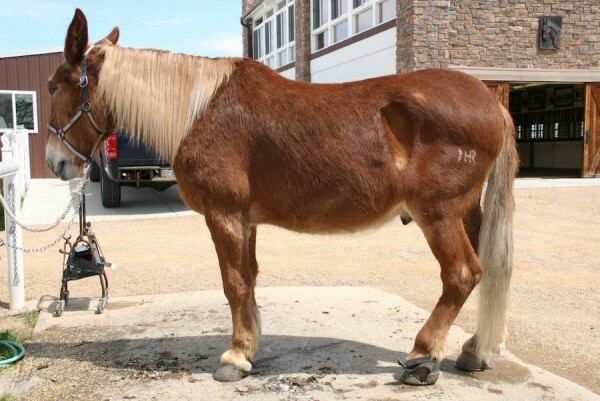 We are happy with his progress so far. Roll continues to stay sound! 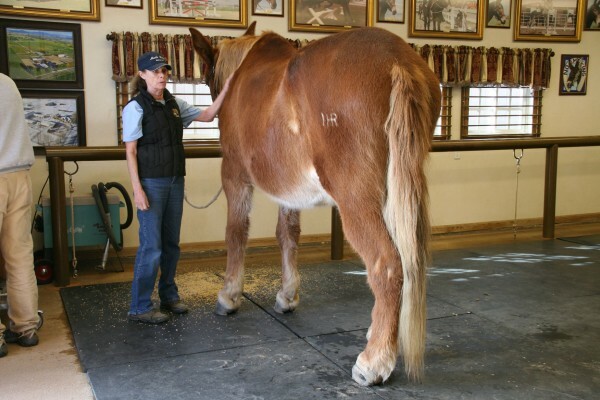 The key to his entire treatment has been to frequently assess the progress and then be willing to be flexible in any changes to the treatment that we might have to do. 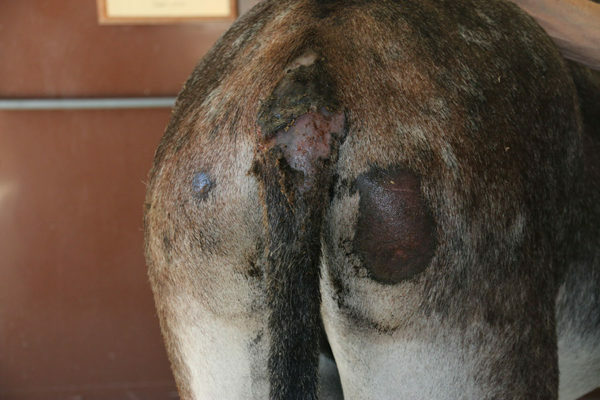 Being proactive like this is definitely the key to success in Roll’s treatment! 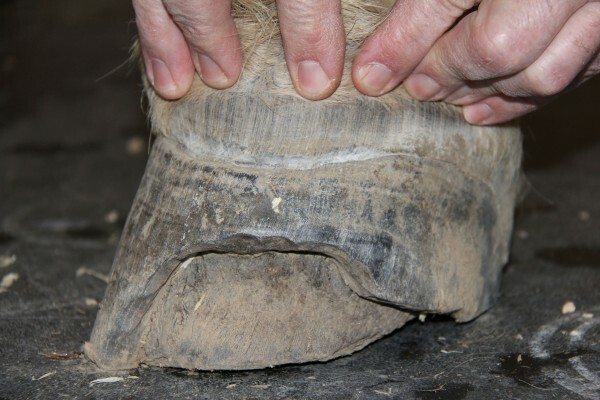 On February 25, we discovered more White Line Disease on the medial side of the foot. We also discovered some strange growth that looked like new hoof growing out of the front of the coronet band and continuing around both sides of the hoof in a uniform fashion. 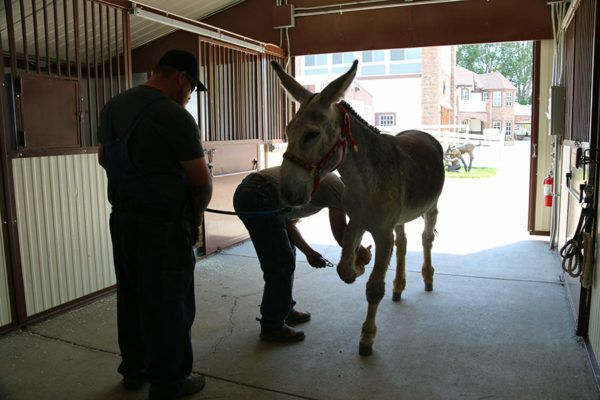 It was pliable which caused some concern, so we opted to follow up with x-rays today. 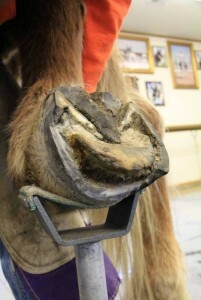 We weren’t sure about what was really happening with this foot. 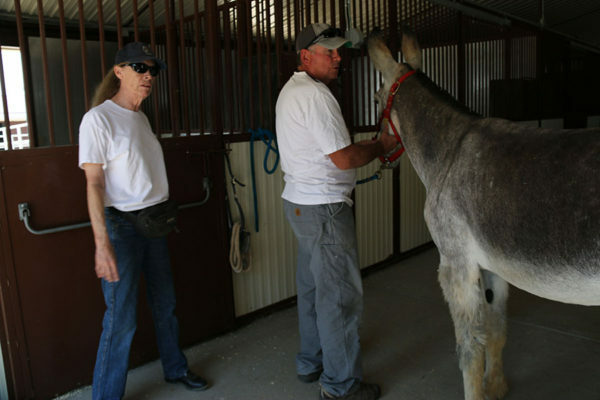 So, we called veterinarian Greg Farrand to come to see this new development and get his input. I clipped the area around the coronet band so we could see the new growth clearly. 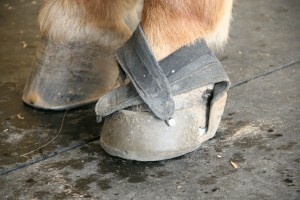 When Greg saw this, he thought he could be trying to slough the involved hoof wall and trying to grow a new foot. We thought more x-rays would be in order to determine if the old hoof wall was dead tissue and if the new hoof wall was healthy and not detached. 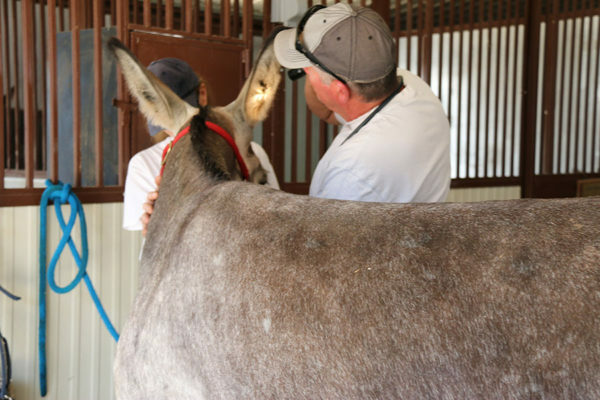 Greg prepped the area with Barium/Mineral Oil beads to identify the band between the new growth and the old hoof wall so it would show up on the x-rays. 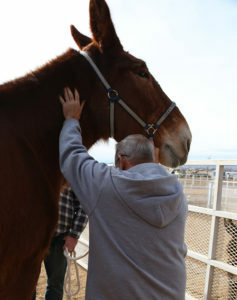 Roll was so sweet and cooperative as we asked him to get back up on his blocks again. 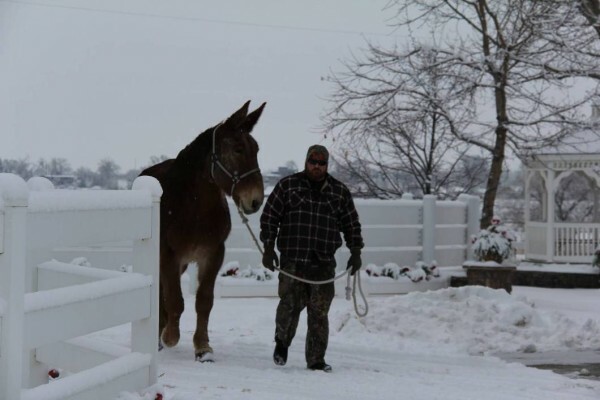 He stood like a trooper! 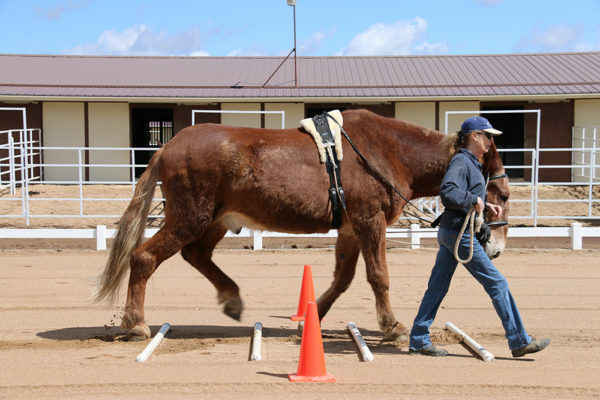 But then after going through our sequential training program, he should and does. The x-rays showed that the new hoof growth was healthy and that there was still live tissue in the old hoof wall. This was very encouraging news! 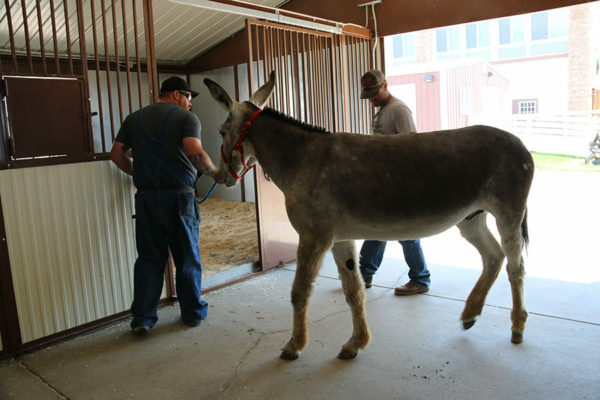 Roll has yet to have one lame day since he came to us, so we all agreed that things looked good…at least for now…and that we should continue forward with his boot and Styrofoam protection. We realize through this treatment process that we need to be alert, notice when things change and be flexible and willing to alter our plans at every turn. Roll is certainly appreciative as are we for all your support and prayers! 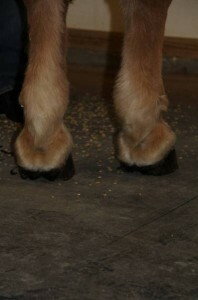 And he is appreciative for a lot of extra oats as well!!! 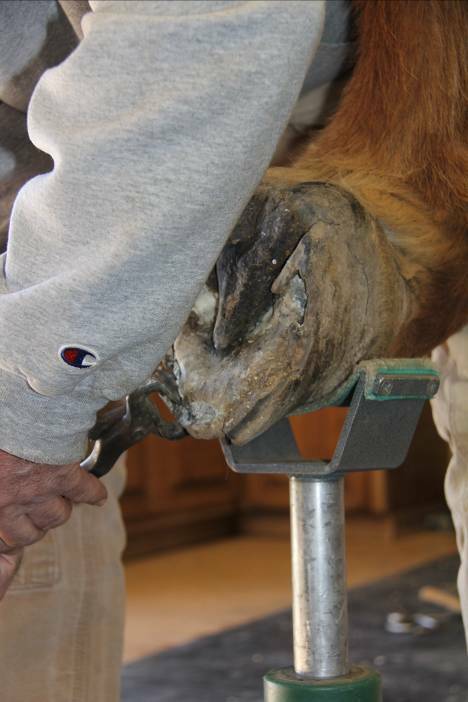 Our farrier, Dean Geesen, came to check Roll on February 5th and took off the protective tape and cardboard that we had protecting the exposed inner hoof. 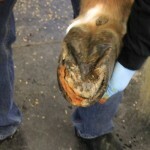 Our veterinarian, Greg Farrand suggested that we discontinue the Providone-Iodine treatment because he was afraid it might dry out the inner hoof wall too much and could cause deterioration and further damage. 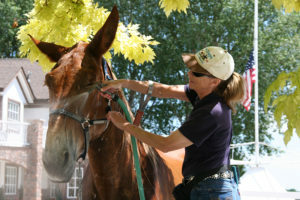 So we proceeded forward with just hosing the area every other day to keep it clean. 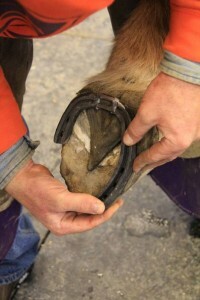 Dean arrived today at 10 a.m. and took off the shoe that had stayed on very well for the full seven weeks. 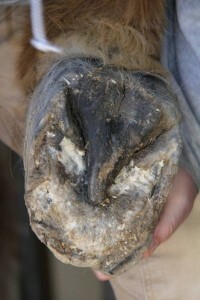 He began trimming the foot and found that Roll had contracted White Line on the medial side of the same foot, only it was not nearly as advanced as the lateral side that had been pared with the hoof wall removed. 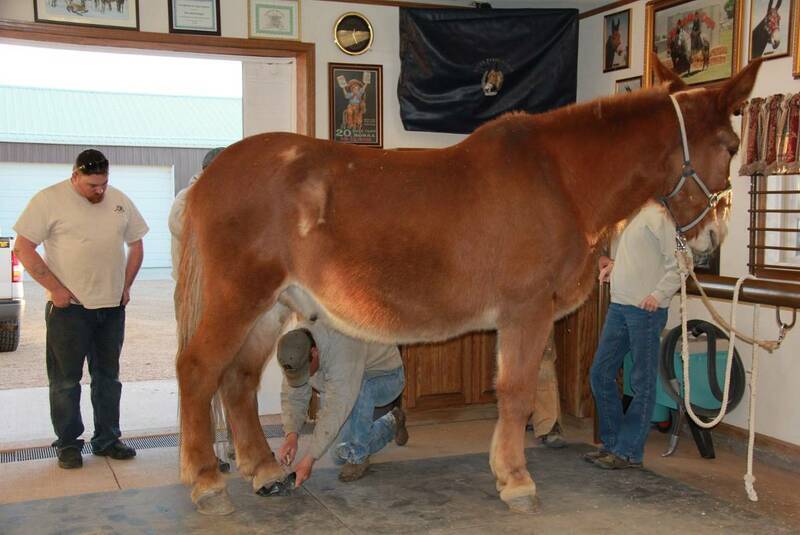 Roll did have over a half inch of growth in the foot which was a good thing. 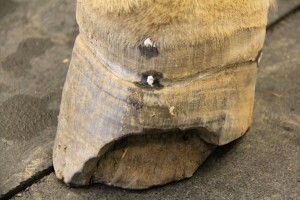 He pared away the part of the hoof wall and dug out the White Line fungus. Then he noticed that Roll was growing rather odd looking tissue along the coronet band. 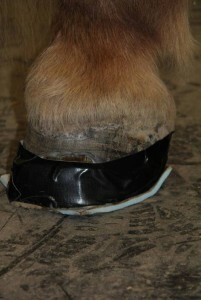 Dean said he had not ever seen anything like this, so we called Greg and he said he would not be able to come to us until the end of the day, so we put a pad over everything and taped it to his foot for protection until the vet could arrive and help us to assess these strange new developments. Greg showed up a little after 5 o’clock p.m. and we began our discussion. Dean thought the foot might be dead after no sensitivity reaction to the hammer. 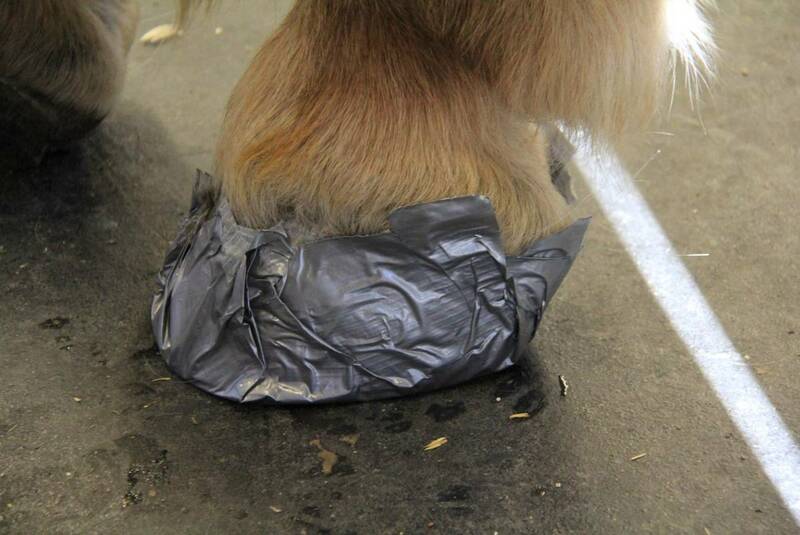 We were all concerned after removing the Styrofoam and tape that the issue with the coronet band would be serious, but upon inspection, Greg thought it looked like he was just trying to grow a new hoof. We opted to set a date next Tuesday to do x-rays to make sure that the new hoof was not separating. Then we looked at the imprint of his foot on the Styrofoam that had been taped on all afternoon to see where the pressure points were and it looked like the way he stood on the foot had adequately supported the coffin bone. 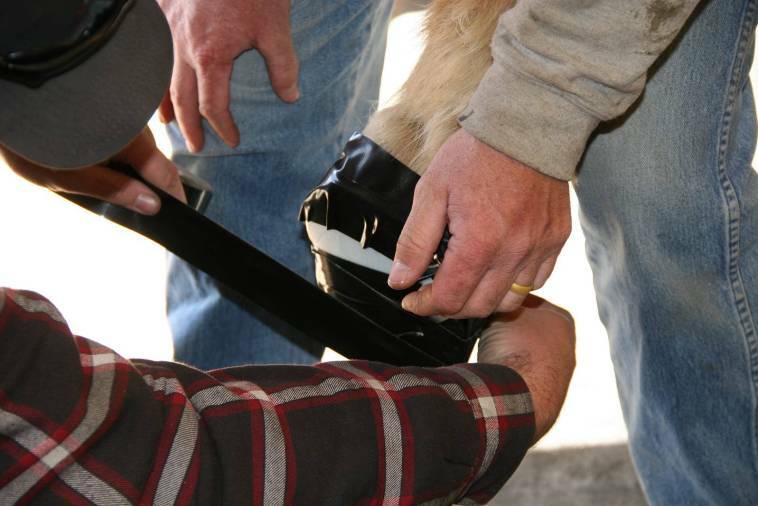 Rather than using the tape to adhere the Styrofoam support, we decided to try using Rock’s old custom-made easy boots and just put the Styrofoam pad into the bottom of the boot. The boot fit and we cut the Styrofoam to fit inside of the boot. 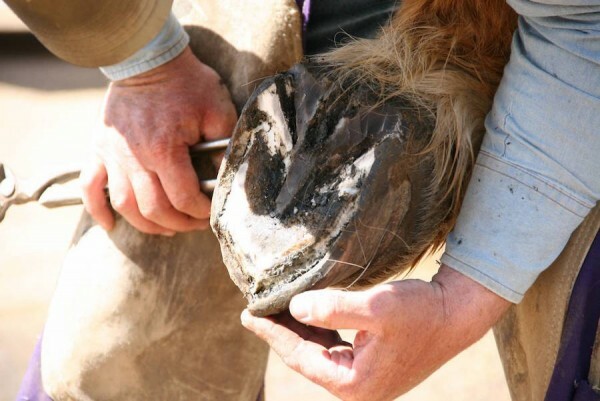 We will routinely check to make sure it stays thick enough to do it’s job and maintain the correct pressure to the bottom of his foot and change it as needed. 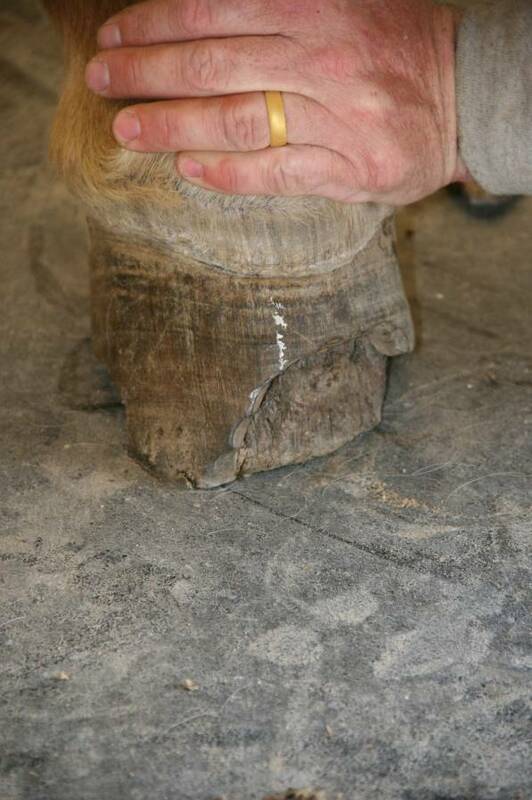 We determined that perhaps there was only nerve damage in the foot that was causing the non-reaction to the hammer. 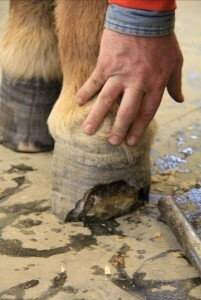 We agreed that there could still be adequate circulation to the foot or he would be lame if the hoof was dying. 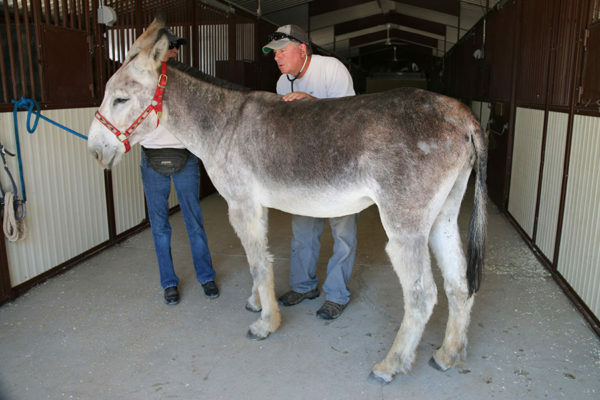 And, he has not had one lame day since he come to us in December of 2010. 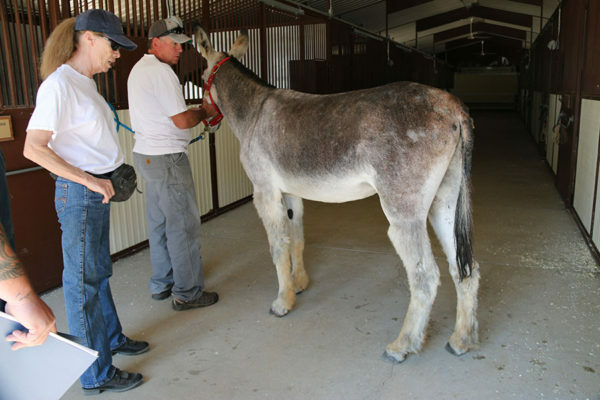 We ended this session and all agreed to meet for the x-rays on Tuesday of next week to obtain more information and determine our plans going forward. The very last test was to see how he walked with the Styrofoam lined boot. 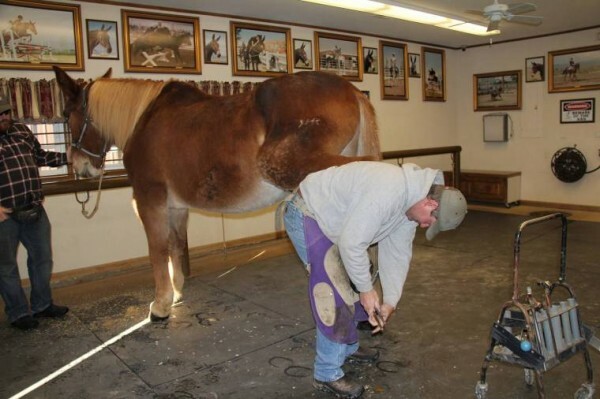 We would need to check to make sure the straps don’t rub and cause an issue. If they do, we plan to pad them with rolled cotton. 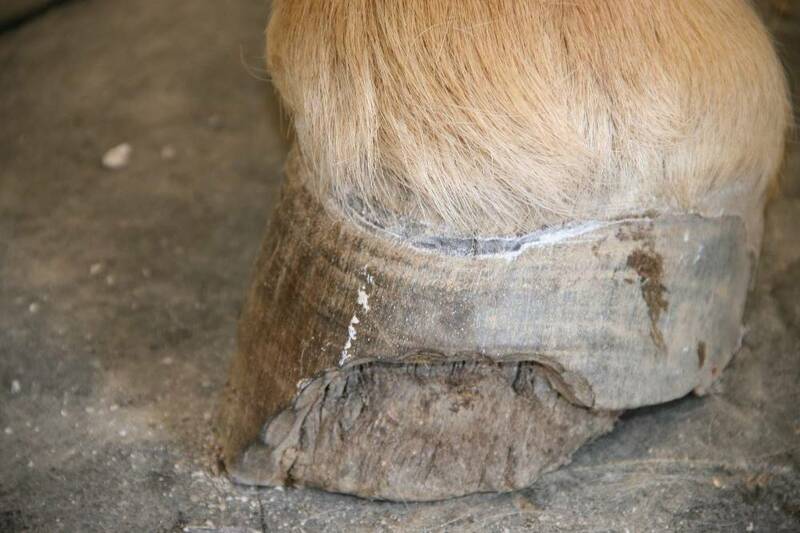 This is quite a setback, but there is still HOPE!!! 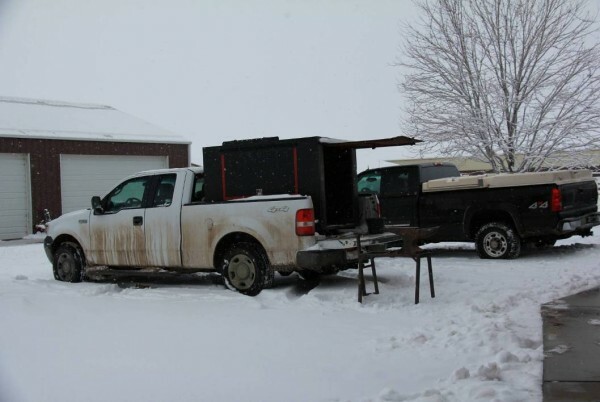 Keep the prayers coming… they’re working! 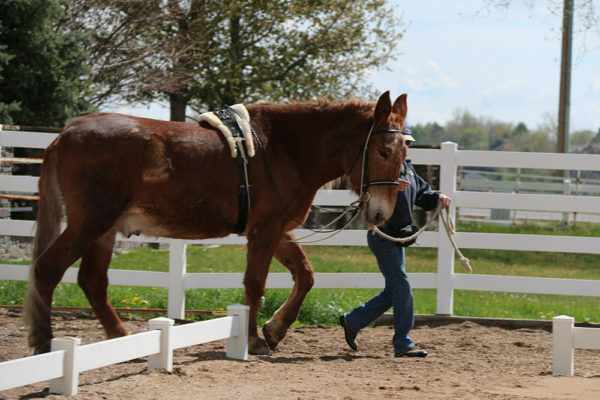 We got the team together again today with Roll to assess what we were going to do going forward. The hoof wall did what we hoped it would for eight days and stayed intact with daily cleaning and new wraps, but it was now beginning to get stress marks at the heel. We knew that without adequate circulation to the area, it would no doubt begin to deteriorate. This bought us some time, however to brainstorm for a solution to the support problem going forward. 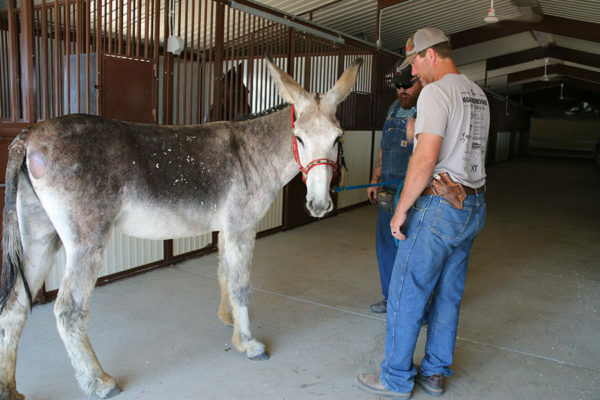 Our support team arrived including veterinarian Greg Farrand, farrier Dean Geesen, assistant farrier intern Lance, Ranch Manager Chad Leppert, assistant ranch manager Steve Leppert, my assistant Kristen Florence and me. 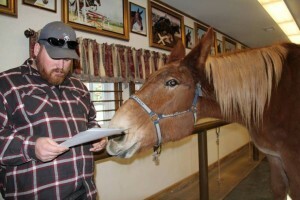 We discussed whether or not to resect the hoof wall. 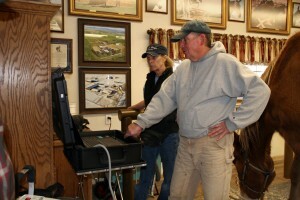 How we did this was an important consideration. The nippers could cause torque that might result in cracking. 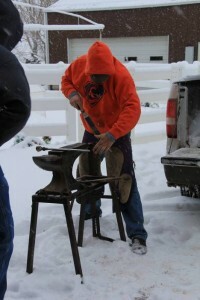 We discussed whether or not to use nippers only or a dremel, or both. We discussed what kind of support would be needed from the shoe and we were concerned about the limitation for nailing the shoe onto the hoof since he does not have much foot left to nail to. We finally decided to use both the nippers and the dremel. 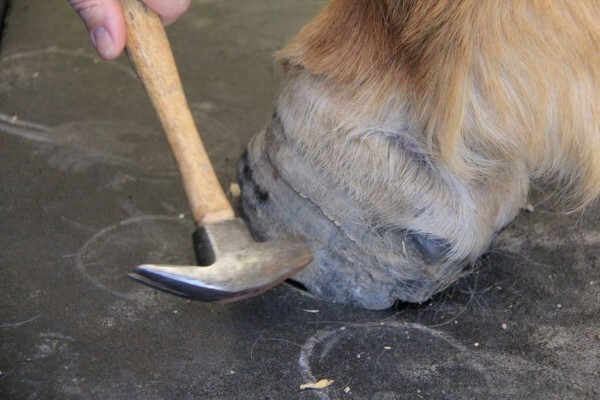 Dean first nipped away at the hoof wall in very small increments with both the straight nippers and then in the smaller areas with a rounded narrower nipper. When he got all that he thought he could safely done with the nippers, we then went after the edge with the dremel to create a smoother line that would inhibit cracking. 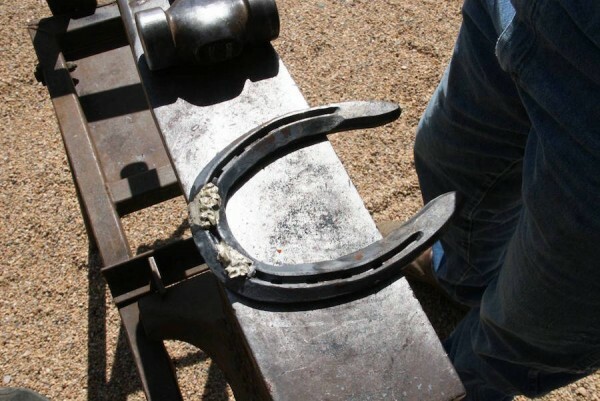 Then Chad cut down the custom made the shoe to fit what was left of his foot. 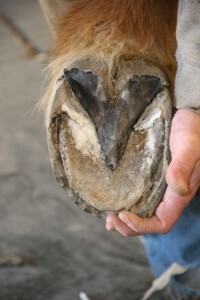 We opted not to go completely around the toe, leaving it and the left side open and covered the hoof across the heel instead. Dean put a bead of borium on the shoe at the toe of his opposite foot for traction and it was useful the minute we took him out of the Tack Barn and onto the snow leading to his pen. As he stepped onto the slick snowy surface outside, the good foot did slip, but he was able to catch himself with the Borium bead. We talked about doing a test to see what kind of circulation he had in the foot and decided it wasn’t really feasible to do it. 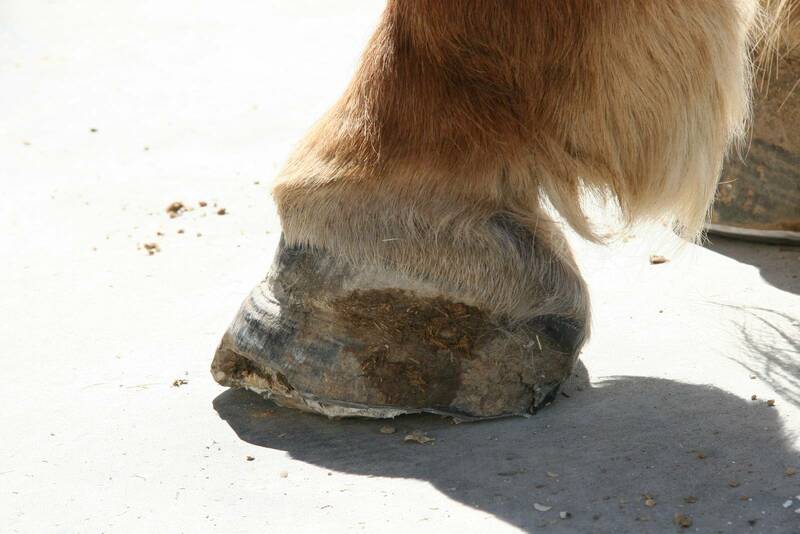 Roll has side bones and ring bone in the foot and that alone would produce irregular circulation patterns in the foot. 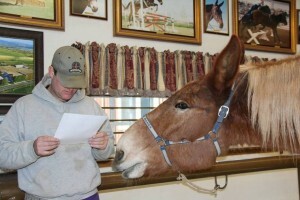 Therefore, the test really wouldn’t reveal anything that would be helpful at this point. We opted not to do it. 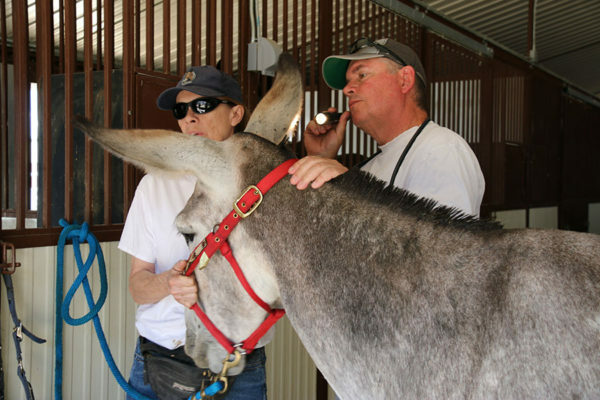 We also talked about doing an ultrasound on the connective tissue to make sure we had cleaned out all the fungus, but again, it really wouldn’t tell us anything that we didn’t already suspect to be true. 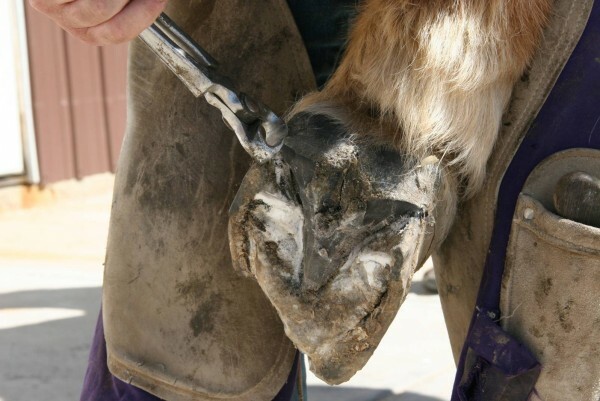 The main concern was if there was any more fungus left in the foot, but after resecting the hoof wall and cleaning the affected area, we could see with our own eyes with the help of the x-rays that there was nothing left to ultrasound. We put Roll’s foot onto the hoof stand, checked it once more and then Dean set the ¾ custom-made bar shoe with minimal nails that he and Chad had made. He then taped cardboard over the affected area with gorilla tape to keep the glue away from it. 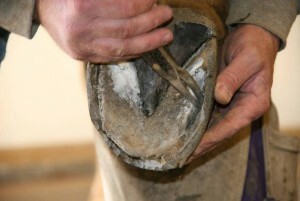 Once that was in place, he then applied an extra-hardening glue to the bottom of the foot to hold the pad in place. 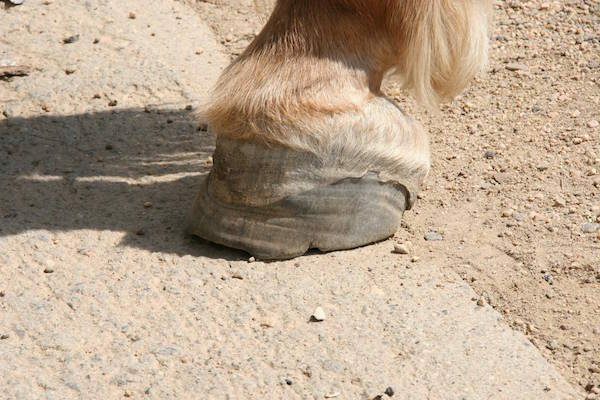 This would lend more support to the hoof and allow it to do its job more closely to normal giving the sole and frog a more even surface of pressure. 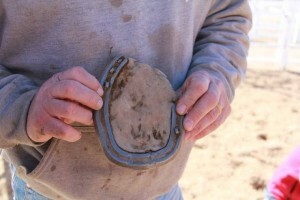 Once the glue was in place, he put on a tough blue pad to provide some support to the sole and to help hold the shoe in place. 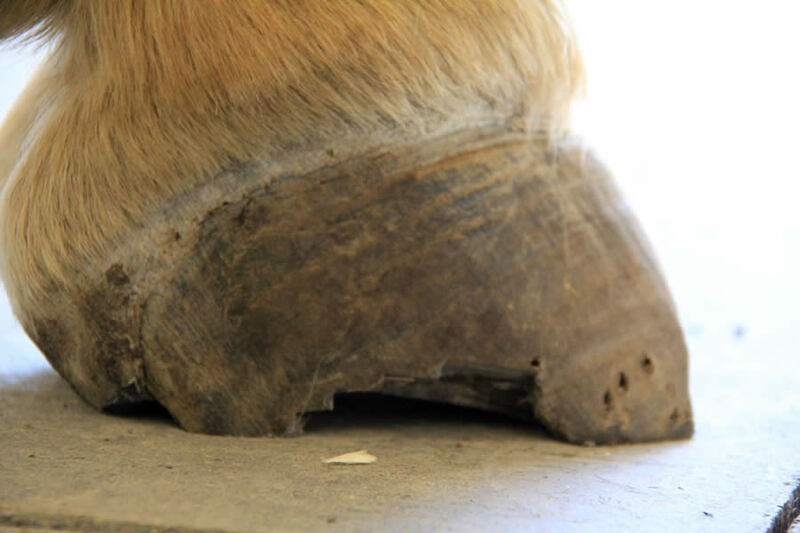 Our veterinarian, Greg Farrand suggested that we brush out any dirt and debris that adhered to the foot every other day as the pad and cardboard were compromised. 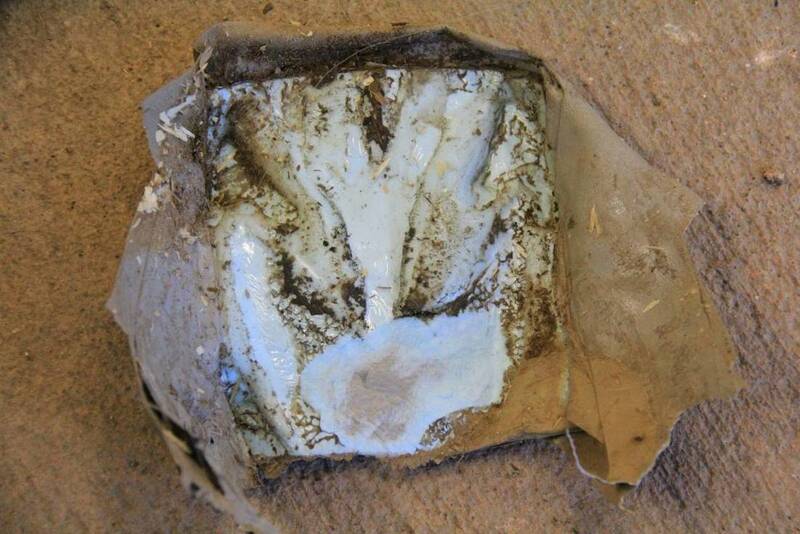 Then we would just cut new cardboard and wrap the tape back around the affected area to keep most of the debris out of the affected area. 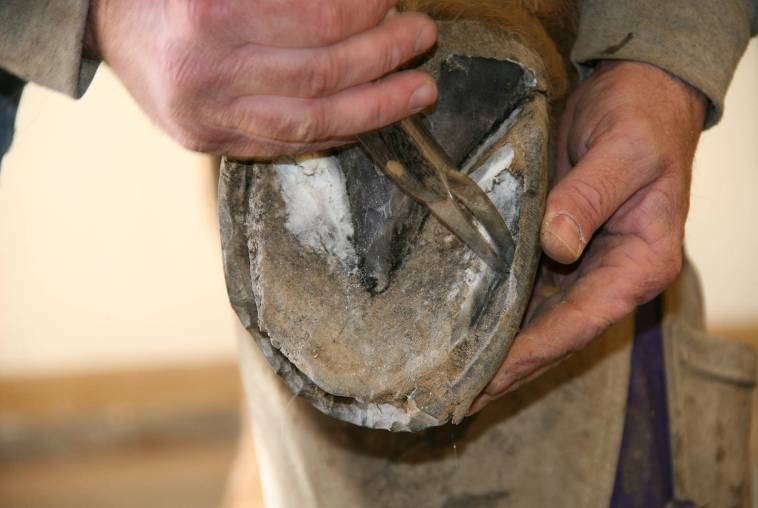 We had to use both minimal nails and glue together to keep the shoe in place and we will try to go 7 weeks before re-shoeing if possible. Our local farrier supply house, “Oleo Acres” recommended using the supplement Hoof Power made by Delta Mustad Hoofcare Center in Forest Lake, Minnesota to help accelerate hoof growth. 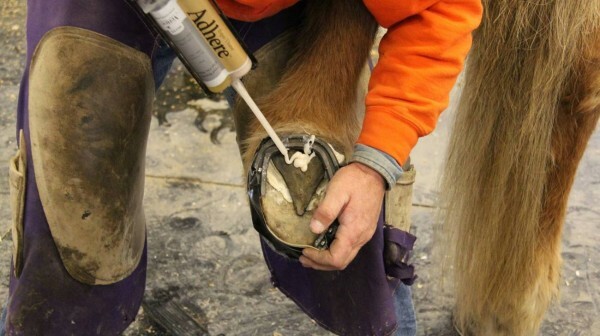 We opted to use Providone-Iodine to clean the affected area every other day as Greg said the concentrated “White Lightning” was better to use at the onset and for a shorter period of time. 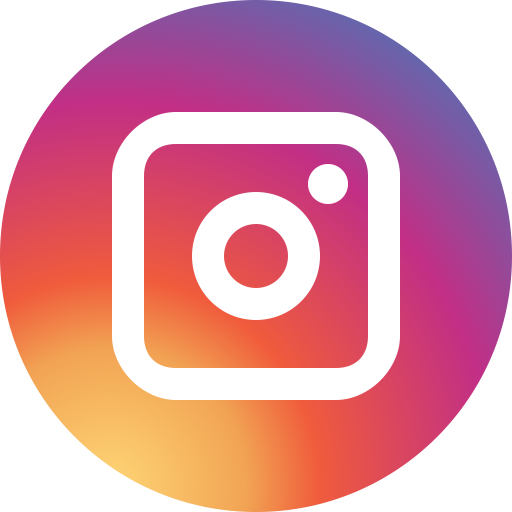 As we go forward, we will be sure to continue to share our experience with all of you. Please continue to keep Roll in your prayers. 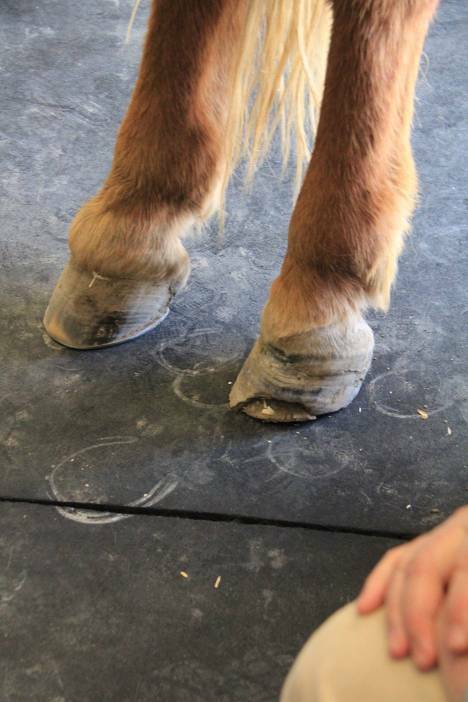 Only five short weeks ago, Roll’s hooves were in good shape. 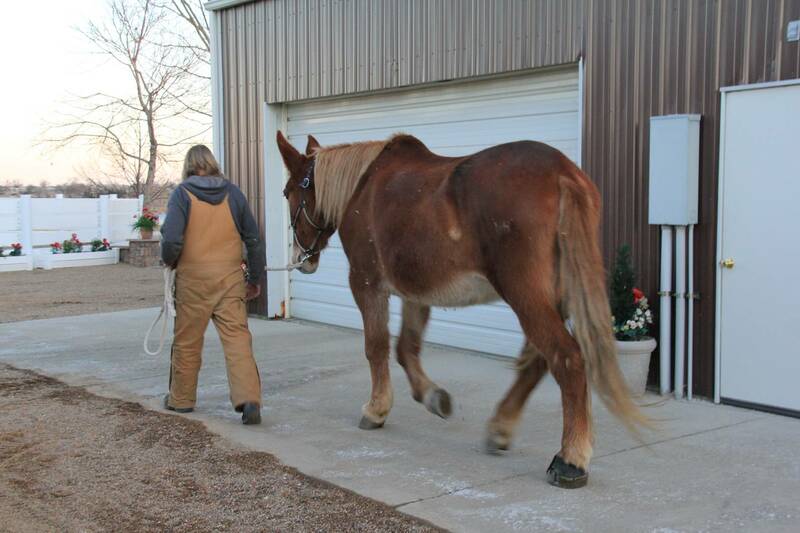 When we brought him up to the tack barn today, he was not at all lame. 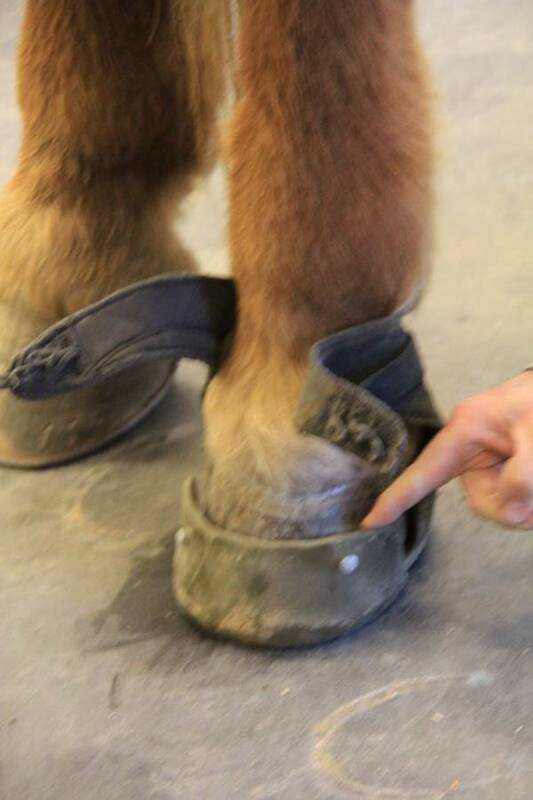 However, when our farrier Dean Geesen arrived this morning to do his hooves again we found that Roll had some fairly advanced symptoms of White Line Disease in his left hind foot. I am just happy that we were able to catch this fast-growing fungus as soon as we did. 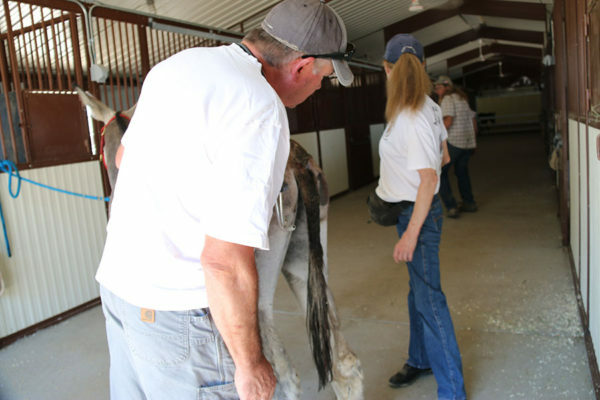 Our other equines are not getting done as frequently as Roll was. 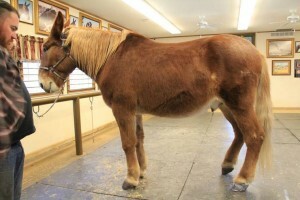 We opted to do him every five weeks instead of every 6-8 weeks because of the severe founder he had before. 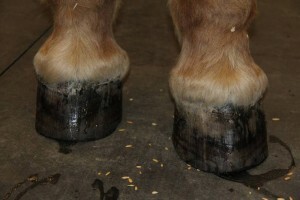 We wanted to be sure to keep his feet balanced so that any hoof growth would not begin to offset that balance. 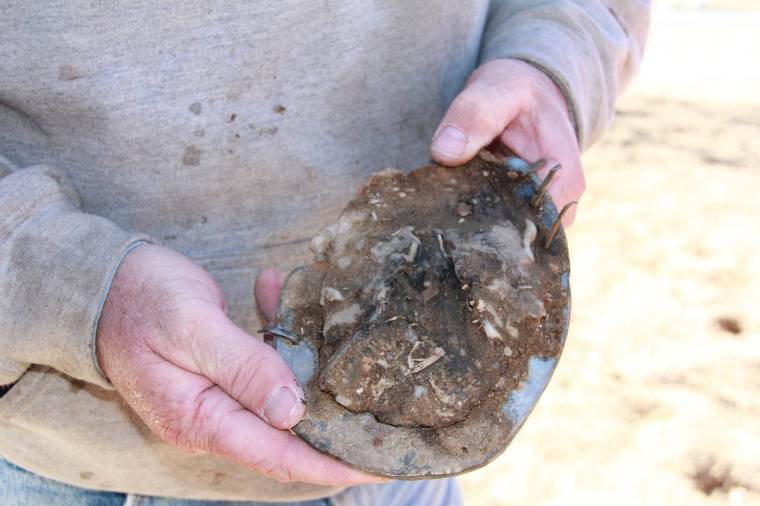 There is no telling how far this fungus would have progressed in another 1-3 weeks! 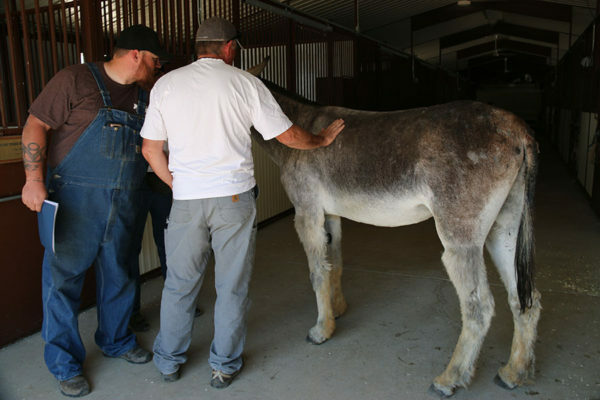 I am so happy that I kept a copy of the article that appeared in the American Donkey & Mule Society’s Brayer magazine in the July/August 2007 edition about White Line Disease. 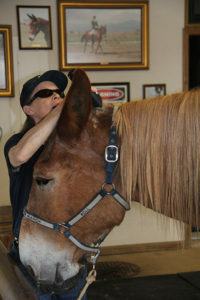 I have kept all issues because here is a wealth of useful information in the Brayer Magazine that now serves as my Longears-Equine Encyclopedia! 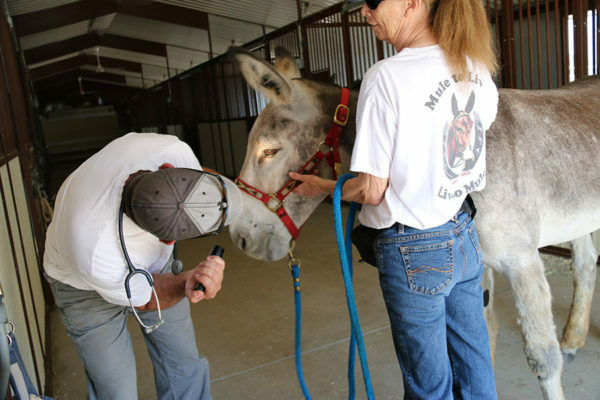 We called our veterinarian Greg Farrand and he was able to come to the ranch quickly to help assess the situation. 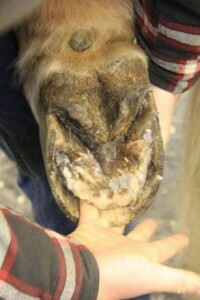 Roll’s left hind foot had a gap in it after Dean cleaned out the fungus of about 4” along the outside of the foot from back to front by ½” wide and almost 1 ½ inches deep. Dean said he had not seen a case of White Line in Colorado in 13 years. 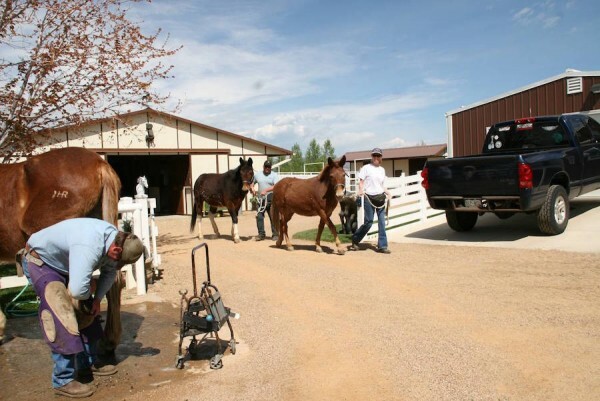 Typically it manifests itself in more humid climates, however Colorado has recently been unusually humid as we experienced with fungus in the hayfields earlier this year. It was a very acute and severe onset! It was so wide and deep that my Ranch Manager Chad could get his finger into the cavernous space. It was a real concern that it had gotten this bad in such a short time. 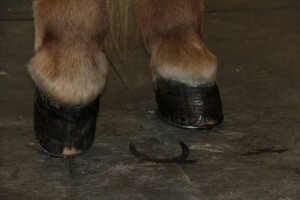 We had shoes on Roll’s hind feet to keep him from dragging them and wearing down his toes. 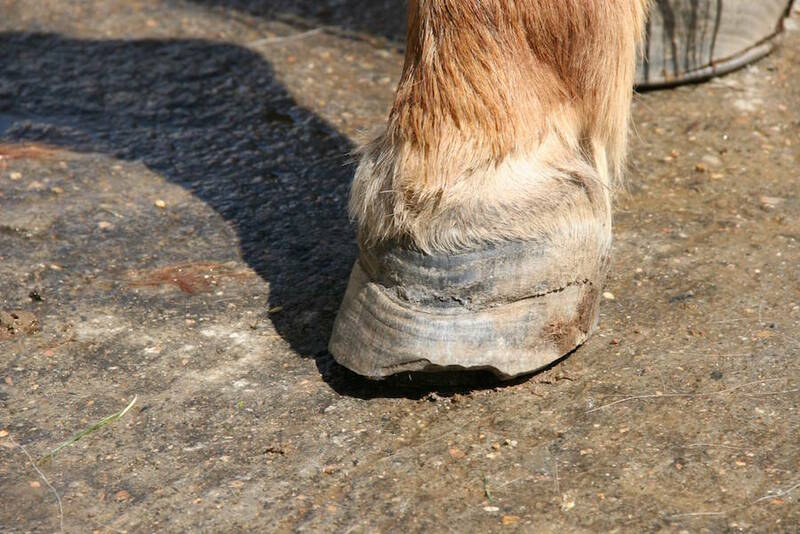 Keeping a shoe on the left hind foot was not going to be an option since there was nothing to nail the shoe to on one side of his hoof. 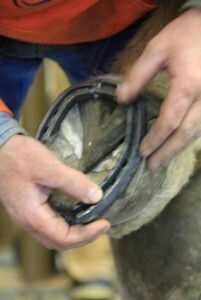 We talked about whether or not to cut away the affected hoof wall. 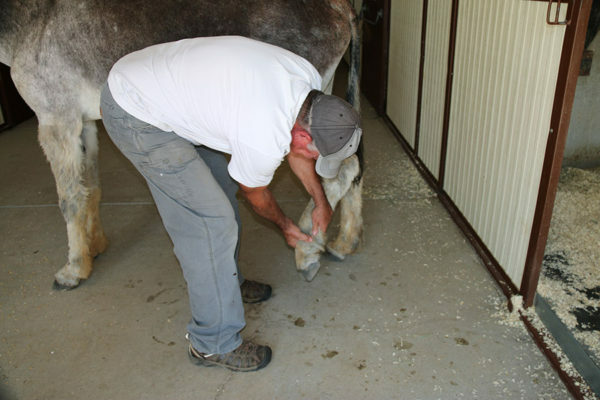 Since Roll is a draft mule and has such large feet, we decided that keeping the “cavern” clean would not be too difficult, so we opted NOT to cut away the hoof wall right away. 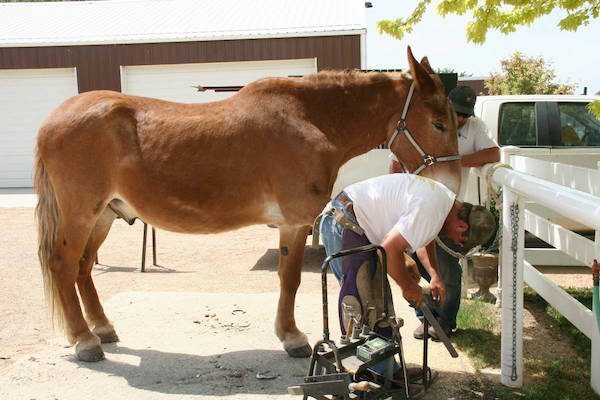 He would need all the support left on that foot for as long as he could get it. 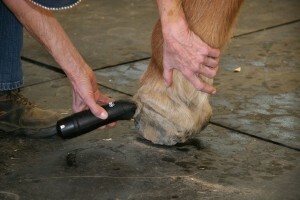 A smaller foot would have to be pared away immediately to treat it effectively. We wanted to salvage the hoof wall to keep his overall balance and the balance of his feet intact as much as we could. We decided that it would be better if we just didn’t put any shoes on the back again rather than causing an imbalance by shoeing the right foot only. 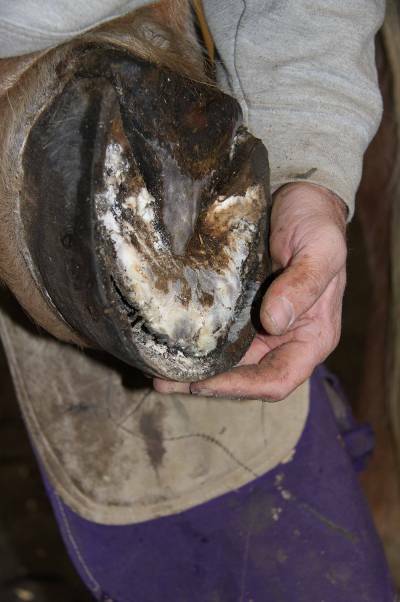 For the first five days, we planned to clean the “cavern” daily, rinsing it with iodine astringent, packing it with gauze dipped in the iodine and then well wrung-out to prevent too much moisture from collecting in the affected area. When dealing with astringents and the like, it is advisable to wear gloves! We took measurements of the hoof so we could accurately monitor his progress. 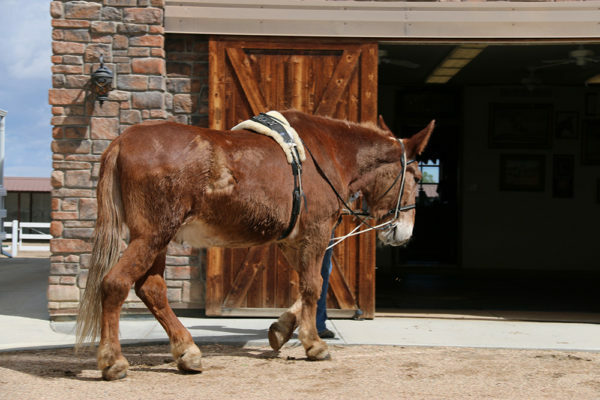 Since this is to be a daily process, we are grateful for Roll’s impeccable manners and cooperation! We talked about whether or not to use an “easy-boot” to hold the gauze in, but decided that duct tape could do the job nicely. 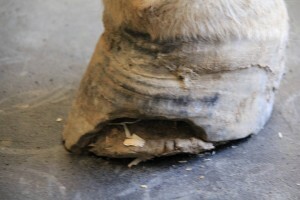 It would be easy to replace daily and would not trap moisture like the “easy-boot” could because the duct tape would erode as he walked on it. This would allow the air get to it and keep it drier to promote healing. 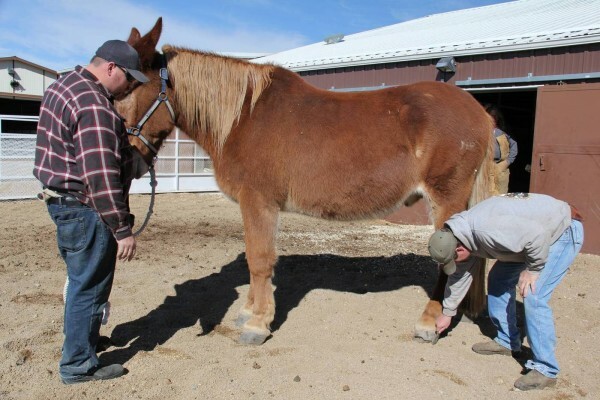 We also decided that it might be prudent to be proactive and put shoes on his front feet since he will no doubt be throwing his weight forward if the White Line Disease begins to cause any pain. Right now, he is sound and not lame at all. That is definitely encouraging. 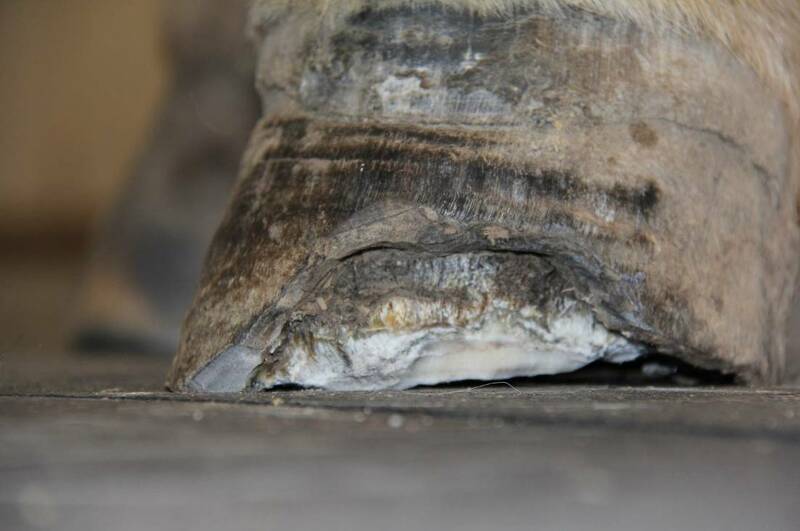 This process will need to be repeated every day for as long as it takes for the foot to be rid of this fungus, but instead of using the astringent iodine, soon after the initial four days, we will x-ray him to get a baseline and make sure we know what we are dealing with. Then going forward, we will use a more diluted form of iodine like Providone-Iodine, Betadine or a product called “White Lightning” that has been developed specifically for this purpose. According to our veterinarian Greg Farrand, these are all antiseptic rinses and any of them should work fine. The prognosis is encouraging. 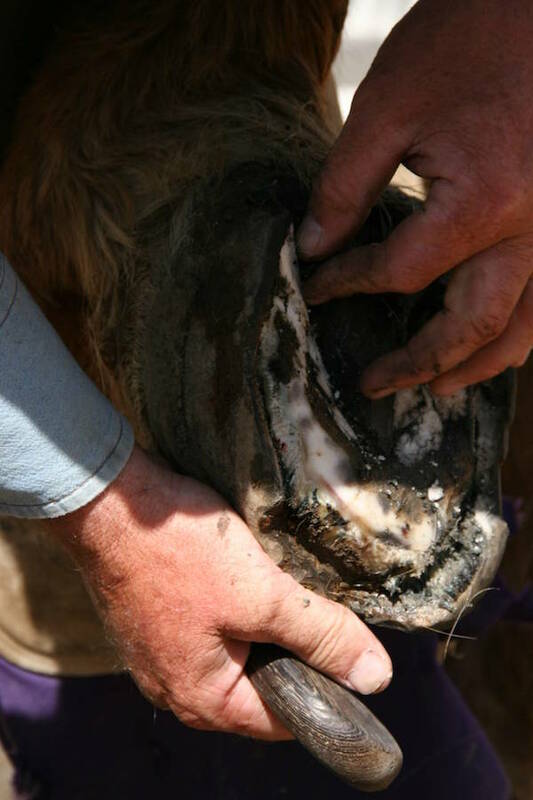 We know we need to make sure the “cavern” is cleaned out thoroughly each day and the gauze and tape are kept clean upon application. 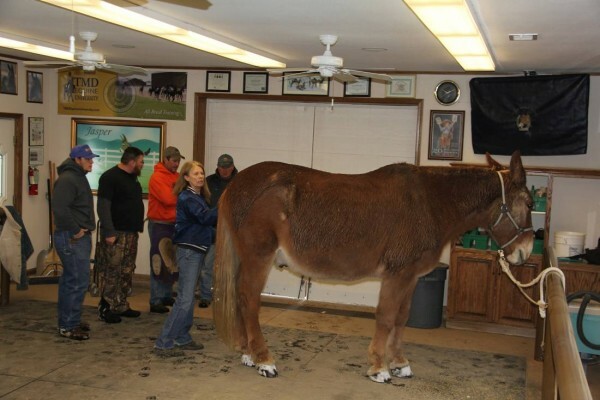 This is a long-term therapy and will take 14-18 months to grow back out…if it can. 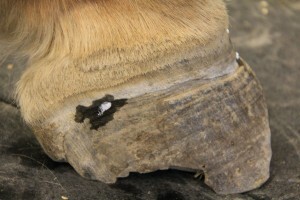 Although White Line Disease is very similar to thrush, it is not a stable management issue like thrush. The onset is quick and there does not appear to be a consistent explanation as to exactly where it comes from. To be pro-active, we added a few more inches of pea gravel to his run so that when the snow melts and the mud mixes with the old pea gravel, we won’t have mud to pare out of the “cavern.” The pea gravel is less likely to mesh with the fungus and should be easier to clean. 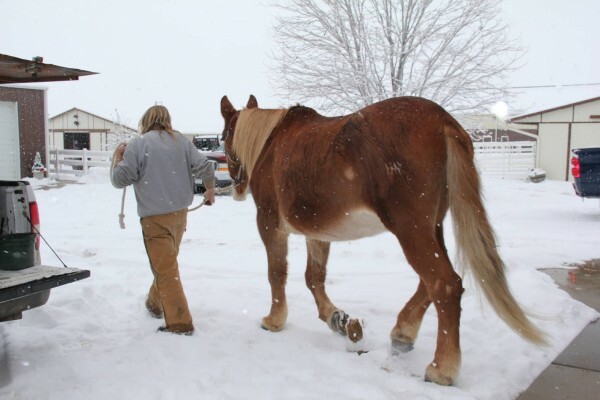 This is just the beginning of yet another challenge in Roll’s journey and we will do follow-up posts to keep you informed on Roll’s progress as we usually do. 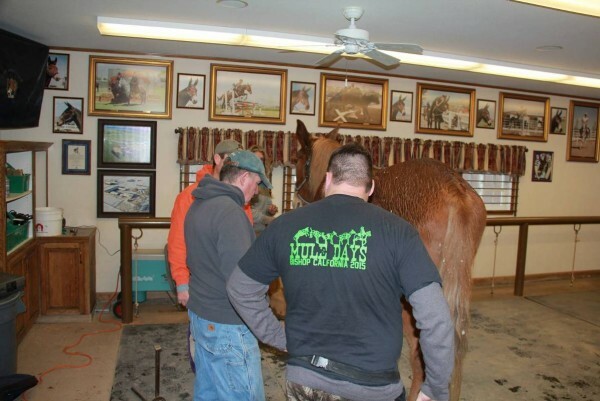 Roll would truly appreciate your thoughts and prayers!